Should I Get Lash Extensions for My Wedding? Eye lash extensions are becoming increasingly popular for brides because they can look so beautiful and will last for up to 4 weeks, meaning you will still look glam for your honeymoon! I am often asked by brides whether they should get eye lash extensions done for the big day or stick to the bar lashes we supply which will just last for the day, (or until you wash your makeup off). It really does depend on what look you are going for. Lash extensions are generally a single hair applied with a permanent glue to your own lash, and shed as your natural lashes do. They often appear very natural looking, depending on the length chosen and the skill or your lash technician. Bar lashes come in an array of styles and hair types, can be a single row or multi layered, long, short, sparse, dense and everything in between. Bar lashes are usually trimmed to size to fit your eye length and applied using a waterproof glue which will dissipate when your face is washed with makeup remover. With individual lashes, your makeup artist will be limited with what can be achieved makeup style wise and may not necessarily enhance your eye shape if the lashes are the same length for the entire row, are too long for your lid to brow bone dimension or too long in comparison to your eye shape and size. Bar lashes allow your makeup artist to help you select a lash style that will flatter and enhance your natural eye shape. 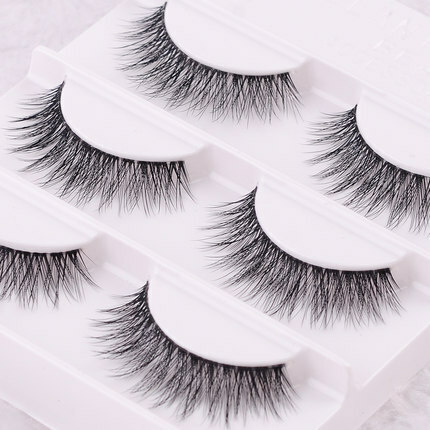 Lash extensions will limit what your makeup artist can use on and around the eye makeup area because certain products may lessen the life of individual lashes by breaking down the glue’s bond. Generally, no oil based products can be used in or around the area where the lashes have been applied. This means that no waterproof products, including waterproof mascara or eyeliner, should be used in this area. There are no such limitations with bar lashes. Airbrush makeup isn’t recommended for brides that are wearing individual lashes because of the over-spray during the airbrush application which will stick to the lashes causing once black lashes to appear grey-ish or flesh toned. The only way around this is to coat them in our mascara, which we can’t often use due to the waterproof nature of it. Even with mascara applied it won’t fully coat all over-spray as it’s very difficult to get into every nook and cranny of individual lashes. Bar lashes are applied after the airbrush makeup has been completed so they are not affected by any airbrush over-spray. The recommended alternative to ensure your individual lashes look beautiful is to go with a hand applied makeup instead of airbrush. This will eliminate any need for mascara and likely product over-spray. Both individual lashes and bar lashes are beautiful options to dress your eyes, but in the end the choice is all yours.